It is clear that the release of Star Wars: The Force Awakens is the biggest movie event of this Christmas season and perhaps of the decade, and outlets like Variety are already predicting that J.J. Abrams’ movie could have one of the biggest opening weekends of all time. The movie’s trailers have certainly looked promising, and hopefully this will turn out to be a great Star Wars film when it finally debuts on December 18th. And one of the first things audiences will see when they are sitting in the theatre and The Force Awakens begins is the legendary “A Long Time Ago in a Galaxy Far Far Away” message as well as the traditional Star Wars crawl text that has been parodied in countless other movies. 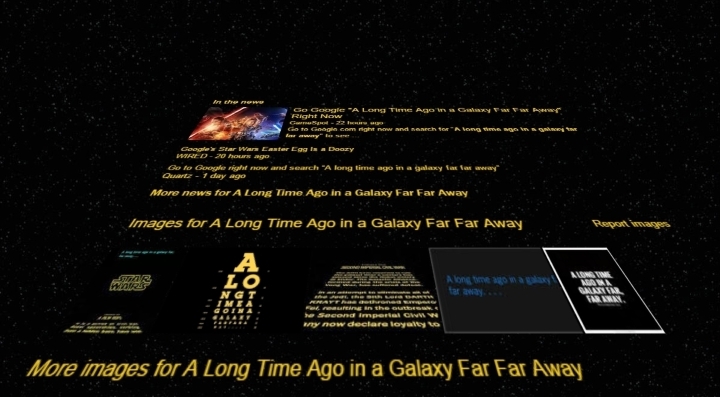 And given the imminent release of The Force Awakens, Google has decided to pay homage to George Lucas classic galactic saga, as searching for “A Long Time Ago in a Galaxy Far Far Away” will produce a search results page that looks like the world-famous Star Wars opening, crawl text and all. It is certainly one of the cleverest Easter Eggs seen to date, even if Google had already given a hint to users in a cryptic tweet that told them to “Search the beginning”. And this not the only Google Star Wars tie-in we have seen so far, as the company now lets users add a Star Wars theme to Google’s services and apps like Chrome, Gmail and You Tube. By visiting Google’s Awaken the Force Within page, users can choose the Light or Dark side of the Force, and their browsing experience in Chrome will be adjusted to reflect this, for instance. In the case of Google’s Chrome browser, images of the upcoming film will appear when you open a new tab, and similar surprises will pop up in other Google services and apps. So it seems that Google has embraced the Force too, and if the upcoming The Force Awakens movie lives up to the massive hype surrounding it, then Star Wars fans the world over are certainly in for a treat when the movie hits the theatres this December. Next: Should You Go for a PlayStation 4 or an Xbox One This Black Friday?